Building a robot company is difficult, very difficult. It requires unwavering belief in yourself, in your idea, in your team and ultimately in your product. But it is also one of the most thrilling experiences anyone could imagine. Why? Because people love robots. Especially social robots. Robots are the reflection of us, in our belief in technology, in our ambition to shape the future. Robots are the exploration between people and machines, the science of artificial intelligence, AI. They test our theory of life, how we think, how we behave and how we want technology to interact with us. When robots truly become social the world will change; we will look at technology as living relationships that enrich our lives, not detract from it. This was our driving belief in building Ugobe pronounced “you-go-be”. Ugobe created Pleo, a life-like robot using our “LifeOS” technology that animates robots with life-like movements similar to living creatures. After countless experiences of watching people transform into proud pet owners through interactions with Pleo, I am absolutely convinced that people want to connect with robots in a meaningful way that touches our hearts. When robots truly become social the world will change; we will look at technology as living relationships that enrich our lives, not detract from it. Pleo was the beginning of a new age in robotics. We learned how to build creative tension into many of our decisions and company culture. We never allowed ourselves to get “comfortable” with how other companies built products. We always challenged ourselves in a collaborative, creative way. These experiences became pearls of wisdom for Ugobe. Of course none of these experiences would have occurred if we were building an industrial robot. No, we were building a social robot. Something new and different. We needed to push the boundaries of what people thought about robots and their relationship to technology. We thought different, we were different. That’s why Pleo is different… and magical. We needed to push the boundaries of what people thought about robots and their relationship to technology. We thought different, we were different. 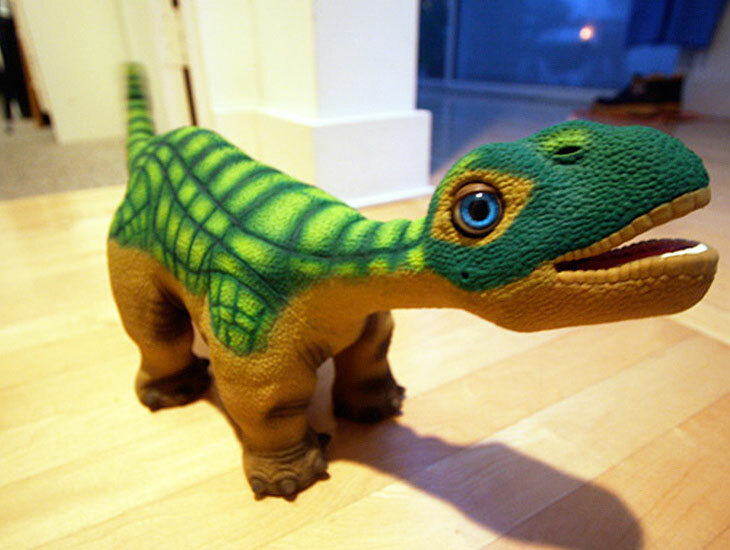 That’s why Pleo is different… and magical. I began my journey into the world of robots in 2003 when I met Caleb Chung, the creator of Furby and a master puppeteer. Caleb discovered a way to manipulate robots through the use of an adapted motion capture suit that mimicked the balance and movement of animals. The result was so surreal and uncanny; a seemingly simple device stitched together by hobby servos, wires, and RadioShack batteries began to move as if it were alive: thinking and behaving like organic life. I felt the urge to touch it, to pet it. At that moment I knew this invention was more then just an idea, it was a platform for creating life-like robots, for blurring the line between people and machines. This was the genesis of Ugobe, the architect and maker of Pleo. Caleb and I decided to launch our big idea at CES in 2004 where we met Greg Appelhof of TRG. Greg represents consumer tech companies (such as Harmon Kardon and Griffin Technologies) and gets them into Best Buy, Target and other top tier retailers. Greg encouraged us to launch Pleo into retail after describing WowWeeʼs success with Robosapien — selling over 190,000 units through retail channels. He believed in our vision to change the robot category to our benefit. Retailers viewed robots as the next big thing and were hungry for innovative products and solutions. After a trail of endless demos and mindless meetings with investors who loved robots but didnʼt invest in them, I eventually raised $26MM for Ugobe. I also forged a strategic partnership with Terry Gou of Foxconn and built a worldwide distribution network with tier 1 partners. We attracted the best and brightest people from Apple, Lucas Arts, EA, Blizzard, HP and Google. Our customers included Nolan Bushnell, Vladimir Putin, Jet Li, Steve Wozniak, Sean Parker and many Silicon Valley luminaries. We learned to stay up late so we could communicate with Asia and wake up early to support our European partners. It took a long time to build Ugobe but it feels like a brief and brilliant moment. Pleo, and the unfortunate exit of Ugobe, five years ago is now robot lore. But what is not known is why we failed and how we could have succeeded if we knew about the 2-year itch. That’s a topic for my next blog. Stay tuned.